Koch’s drama classes and productions continued to attract aspiring writers in the 1930s and 1940s. In 1936, Betty Smith, an accomplished playwright and former student of George Pierce Baker at Harvard, settled in Chapel Hill to work for the Federal Theater Project. She stayed on to teach in the drama program and began writing fiction. Working under the tutelage of Paul Green, she published A Tree Grows In Brooklynin 1943. The novel tells the story of a girl’s coming of age in a poor Irish-American family. 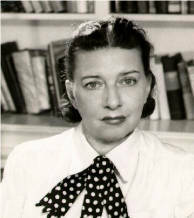 She attributed her inspiration for the novel to Wolfe’s Of Time and the River. Her book was an immense success, a nationwide best-seller that was distributed to servicemen overseas and adapted into a popular motion picture directed by Elia Kazan.